I know it doesn’t feel like it yet, but Fall is approaching and that means all the delicious root veggies are coming. Squash is already beginning to appear at the farmers market. I love to buy up plenty each time I go. It lasts a while when stored in a cool, dry place and I can make it later in the week if I need to. 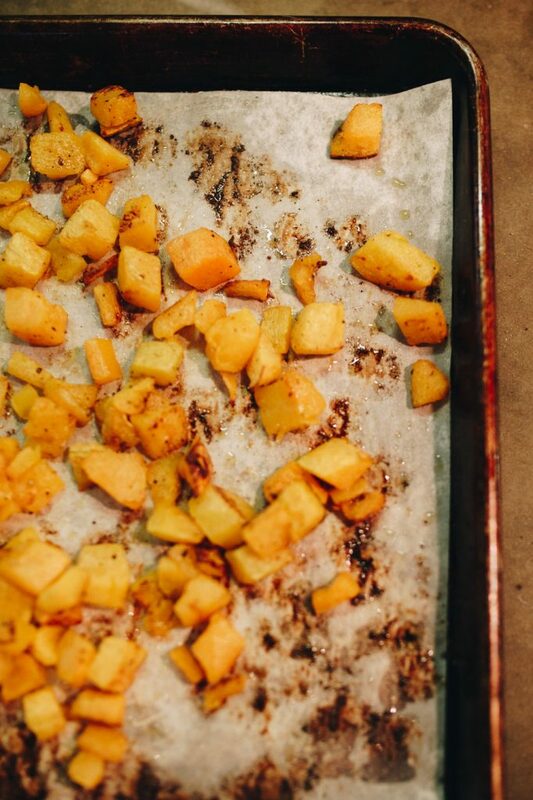 Butternut squash is one of my favorites in the squash family because of its sweetness, especially after roasting. This salad really highlights the squash and the salty, smoky bacon is a great balance. The pumpkin seeds provide the crunch and pomegranate seeds are a really fun burst of flavor with every bite. Goat cheese tops it off with rich and creamy texture and also gives you a bit of a tang. Not only is the salad delicious but it is beautiful to look at. We eat with our eyes first and making beautiful looking food is a part of enjoyment! You could add some shredded chicken to this for a great midweek supper or as a side on the weekend when entertaining family and friends. It will be a hit for sure. This recipe will hold up in the fridge for about 4 days so a great make ahead as well. Give it a try! 2. 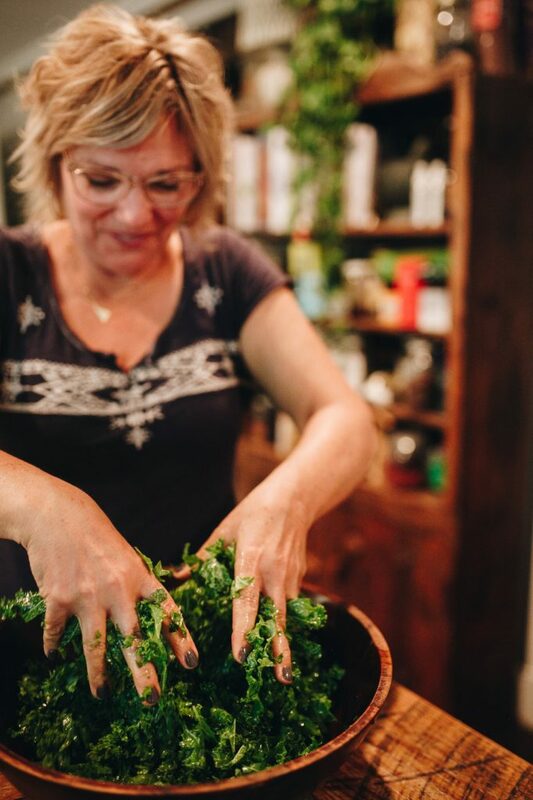 Start by de-stemming the kale and chop it into bite-sized pieces. 3. Peel, seed and cube the butternut squash to get ready for roasting. Layer in a single layer on oiled baking sheet. 4.Roast in 400-degree oven for 25 to 30 minutes or until desired tenderness. Let cool. 5. While squash is roasting, cut up bacon into 1-inch sized pieces and cook in the skillet, low and slow, until browned. 6. With a slotted spoon scoop bacon out onto a paper towel to absorb any excess grease. 7. In a dry, small skillet over medium heat, toast the pumpkin seeds until golden brown. 8. 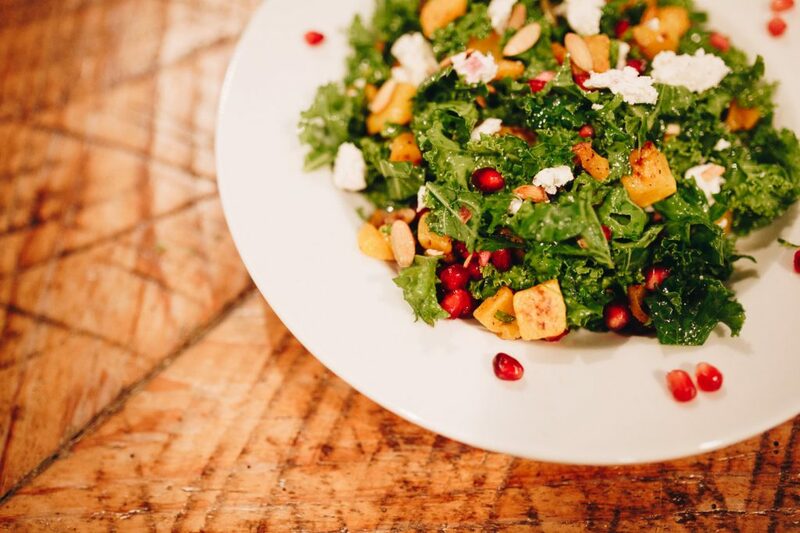 Once butternut squash is cool, place kale in a big bowl, drizzle with olive oil and gently massage for a bit. This helps to tenderize the kale, giving it a softer texture. 9. 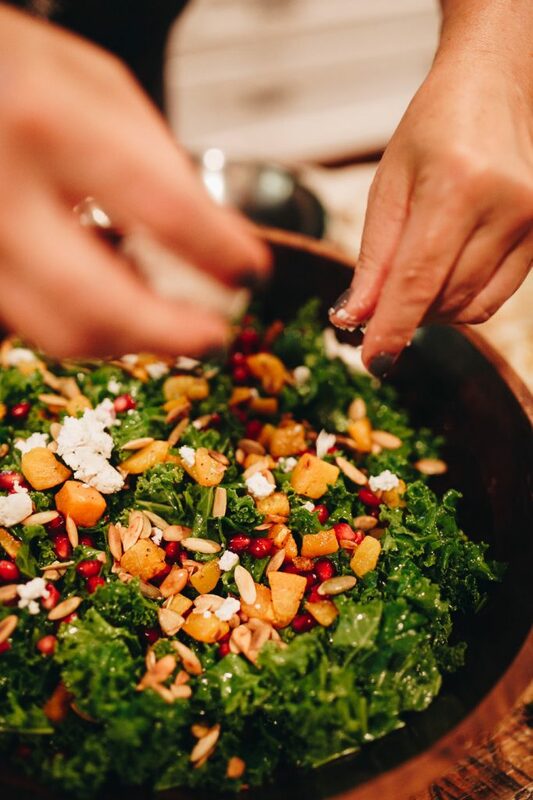 Add the squash, bacon, pumpkin seeds, pomegranate seeds and goat cheese into the large salad bowl. Drizzle white balsamic over the top of the salad and follow up with salt and pepper. Peel, seed and cube the butternut squash to get ready for roasting. Layer in a single layer on oiled baking sheet. Roast in 400 degree oven for 25 to 30 minutes or until desired tenderness. Let cool. While squash is roasting, cut up bacon into 1 inch sized pieces and cook in the skillet, low and slow, until browned. With a slotted spoon scoop bacon out onto a paper towel to absorb any excess grease. 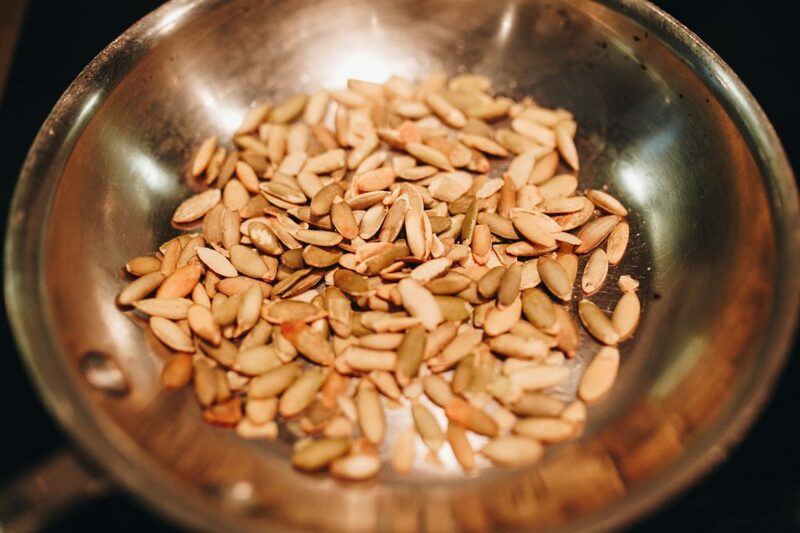 In a dry, small skillet over medium heat, toast the pumpkin seeds until golden brown. 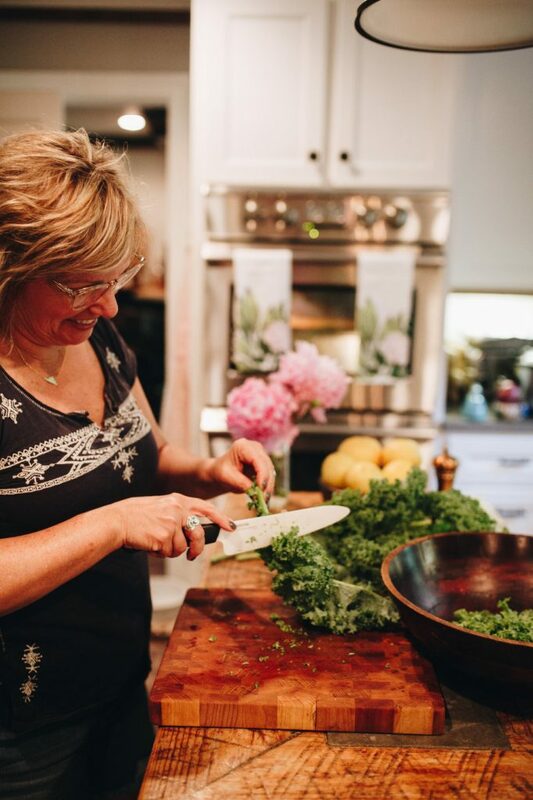 Once butternut squash is cool, place kale in a big bowl, drizzle with olive oil and gently massage for a bit. This helps to tenderize the kale, giving it a softer texture. 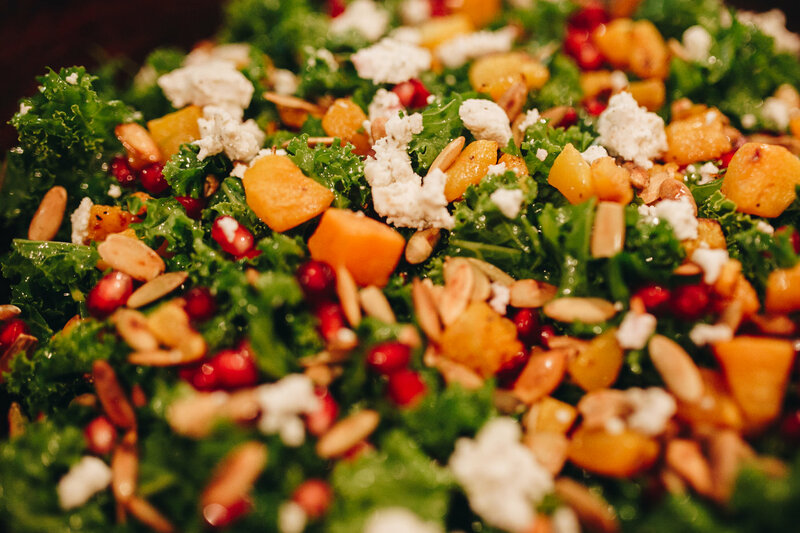 Add the squash, bacon, pumpkin seeds, pomegranate seeds and goat cheese into the large salad bowl. Drizzle white balsamic over the top of the salad and follow up with salt and pepper. TOSS and ENJOY!!!! !